It's the last day of September and it has seemed to be such a long month. 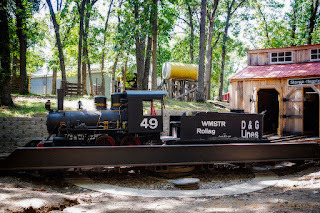 My image today is of the Wagner 14 inch scale locomotive that I get to help operate in Minnesota at the Western Minnesota Steam Thresher's Reunion. I captured it on it's new turntable ready to go into the new Roundhouse. Both things have been a great addition to make it resemble full size operation more.